Move over granite — there’s a new favorite in town. Quartz is quickly taking the top spot for kitchens, baths, laundry rooms countertops and even fireplace surrounds. One of the hardest surfaces on earth, quartz countertops withstand the bumps and bangs of dishes, pots, and pans, as well as resists scratches, stains and spills. Kitchens are still king when it comes to home renovations and upgrades. 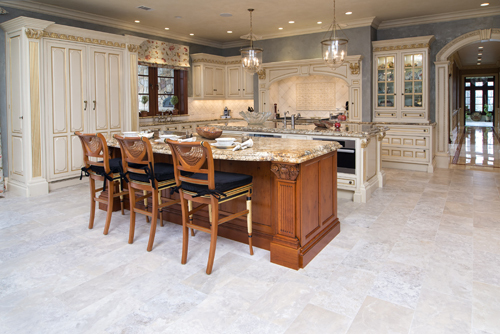 The best place to start with a remodel are kitchen surfaces, in tile or stone. Today’s options for counters and flooring are more advanced than ever, and suitable for any variety of kitchen styles. Anna Marie Fanelli, Vice President & Designer at Floor & Decor in Tenafly, New Jersey, was quoted in Snap Magazine’s “Tile & Stone” section. There are few places more relaxing for the senses than a spa. The soothing atmosphere helps recharge your mind, body and spirit, not to mention enhance your energy level. Rather then visiting a luxury resort when you need a recharge, try bringing the spa to you. Here are some tips for creating the ultimate spa retreat in your own bathroom. New Jersey based interior designer and showroom owner Anna Marie Fanelli designed a bathroom for former Run-D.M.C. member Reverend Run and was featured on his DIY Network/HGTV television show Rev Run’s Renovation. She shares her experience and behind the scenes knowledge with National Builder Supply. 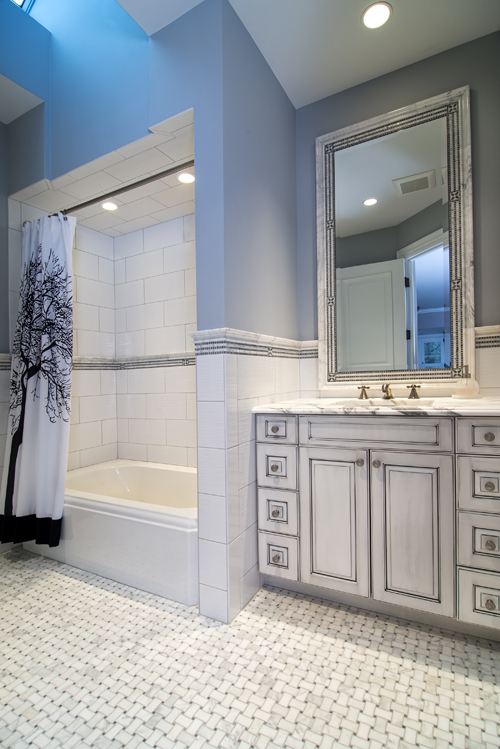 Renovating a bathroom is an enormous task that at times can feel overwhelming. There are many factors to take into consideration before starting your project. Everything from the budget, to the tile design and layout, to selecting fixtures, has to be carefully considered. Once you have those set, call a contractor begin the the real fun! While this can certainly be a bit exhausting, there are steps that you can take to minimize your stress levels and help ensure that your project runs smoothly from concept to completion. Anna Marie Fanelli of Floor & Decor in Tenafly, NJ, recently completed work on two remodels and construction of a third for the 9,000 square foor home in Norhtern, New Jersey, which is featured in the DIY Network Series “Rev Run’s Renovation.” In the bathroom of the oldest son, Diggy, the floor consists of 12- x 24-inch Serenissimo Silver Travertini polished porcelain tile in an offset pattern. Anna Marie Fanelli of Floor & Decor in Tenafly, NJ has been awarded “Best Of Houzz” by Houzz, the leading platform for home remodeling and design. The tile, stone and plumbing design studio was chosen by the more than 16 million monthly users that comprise the Houzz community. Rev Run is from the rap group, Run DMC, who makes it a family affair as their residence is completely renovated. Anna Marie transformed DIggy’s, Russy’s and Miley’s baths by tackling their extensive bath renovation project by serving as their Tile Designer. Anna Marie also selected tile for Rev Run’s Spa Room. As of March 28, 2014, Rev Run’s Renovation is airing on HGTV and you can also see Anna Marie again. New Jersey based interior designer Anna Marie Fanelli has seen quite a few bathroom renovations in her 20+ years in the design industry. Below she shares her step by step process to make your bathroom renovation smooth and worry free. Set in Alpine, one of New Jersey’s most exclusive towns, is a newly built 15,000-square-foot estate — elegantly dressed throughout in natural stone and Italian tile. Anna Marie Fanelli, co-owner/designer of Floor & Décor in Tenafly, NJ, worked closely with her clients to deliver just the right aesthetic they desired for their palatial living space. The luxurious NY residence originated from three different apartments joined together and finely renovated to create a single living environment. This 400 square foot home is located in Trump Plaza, New York. Thanks to its sophisticated aesthetic language, the project – designed by Anna Marie Fanelli – received an honourable mention in the “residential” category of the Ceramics of Italy Design Competition 2012, which took place on the occasion of Coverings 2012– the largest international tile and stone expedition, held in Orlando, Florida. Tying it all together is tile and stonework that sets the standard for variety and creativity and gives rooms their individuality. That main-floor powder room exemplifies the work of tile and stone designer Anna Marie Fanelli of Floor & Decor, who cued the color throughout the rest of the home. Here, the floor comprises hexagon tiles in shades of slate, onyx and quartz bordered by 12-by-12-inch Inca gold marble; the colors match covers in a faux-bookcase wallpaper, a bold choice by the homeowner. When it comes to residential design, most would agree that kitchens and bathrooms are considered high priority. And while function is a necessity, many homeowners have come to desire much more for the design of these spaces. Aesthetics play a primary role, and homeowners are turning to the assortment of textures, patterns and sizes found in the limitless tile collections now available to create their dream kitchen and bath. TileDealer: How did you get started with tile? Assemblywoman Vainieri Huttle presented Anna Marie Fanelli, Co-Owner of Floor and Décor in Tenafly, with a resolution from the New Jersey General Assembly recognizing her meritorious record of achievements as an award-winning designer and successful local small business owner.